Usually when I interview guests it is normally behind the computer screen, so this was a treat interviewing this week’s guest in person. It was recorded at the DC Podfest conference I attended in November of 2016. You will find the chat with Reina Pomeroy to be very enjoyable! Growing up, Reina’s family was fairly well off. Her father was an attorney, and she grew up in an affluent neighbourhood in Southern California. In some ways her parents were quite frugal, but she never had to worry about money growing up. Although her parents never really had any money conversations with her other than basic budgeting, she always felt secure. She shares how her parents’ love language for her was gifts – they truly loved their gifts. In time, she realized that her love language was quality time. Despite not needing to work to pay her tuition which her parents helped her with, in college she worked 3 jobs with a 20 hour a week course load. For her, this was her way of proving to herself that she could take care of herself. On the other hand, she shared how while she didn’t have to work to pay for school but did anyways, her friends HAD to work, and she felt guilty about that. Reina’s is now married with a young son, and her husband is a Marine. The Marine Corps has briefings on budgeting and how to manage your finances, so there was a great deal of transparency between her and her husband very early on in their relationship. They shared credit scores, budgeting, they looked at each other’s bank account and didn’t lie to each other. They had lots of conversations about what their priorities were, and how each of them spent money. Having grown up in different circumstances, most of the headbutting they experienced came from lifestyle decisions like how much eating out vs home cooking they would do. At one point Reina took care of her own business accounting, and on the last Sunday of each month, she and her husband meet to go over all the monthly expenses. They use credit cards for everything, and pay everything off at the end of the month. The rest of their funds go towards savings and their emergency fund. Reina’s business contributes to the budget as well. There are two things she claims to be the best money she has ever spent. The first was travelling back to Japan where her family now lives. The second, making the decision to start her business and invest in it, in her coaching business, and her education, as well as paying for her son’s daycare when she went back to it. For Reina, any frivolous spending she has done over the years has been the worst money she has ever spent. She exercises a daily practice to be conscious of her spending. On April 1, 2015, when she started her business, she had a part-time job and was a new mom. She used the income from her part-time job to pay for daycare for her son, and invest into coaching training, branding, a website, and within a couple of months she was fully booked. 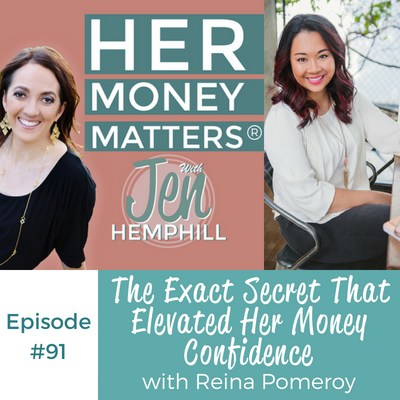 When Reina first started her business, she kept track of her expense on a spreadsheet. When the line items became more and more frequent as her business grew, she found she was not as consistent as she needed to be. She hired a bookkeeper, despite being quite resistant, and the confidence of knowing her numbers was more than enough validation to her that this was a worthwhile expense. Every month she gets her P&L Statement, and reviews it to make sure she is getting a the return she needs on her investments. Because forecasting is not her forte, she has people to help her with that. She also uses credit cards frequently, but pays them off every month as she ensures she has the money beforehand. Reina is involved with Pencils of Promise, an organization that create schools, programs and global communities around the common goal of education for all with 100% of all online donations going directly to their programs. Her goals is to save $35,000 in order to build a school and has a plan to accomplish this in 1.5 years. To be notified when the Fearless Money Sisterhood opens again you can do so by clicking here.